Symbols / logos are very important as a method of presenting information. For instance, everyone knows that the ‘First Aid’ symbol is a white cross on a green background. The example below shows one way of developing a symbol by combining two existing symbols. The customer services symbol and the first aid symbols have been combined to form the symbol that could be placed on the packaging for an emergency mobile phone. The phone will be used to telephone the emergency services. It could be issued to hikers / walkers in a National Park. If a hiker was to have an accident or get lost in severe weather he/she could ring the emergency services directly. 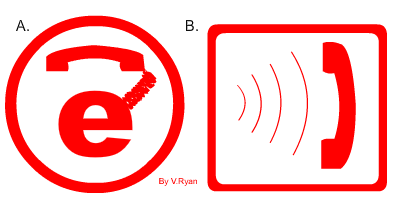 In boxes ‘A’ and ‘B’ sketch two symbols representing ‘Emergency Services Mobile Phone’. Then select your best design and produce a colour rendered version in box ‘C’. Look at the two sample symbols / logos. They have been designed for the packaging of an emergency mobile phone, to be issued to the elderly. Which of the two symbols is most suitable for this purpose? Explain your answer.